What is restart.exe? Should I remove it? restart.exe is a legitimate executable, which is related to F-Secure Antivirus from F-Secure. This file is responsible for launching this program and managing its components, so you should never terminate this process if you don't want to have issues with that. Of course, if you don't think that F-Secure Antivirus is useful, you can easily get rid of this process. For that you should go to Task Manager and end this process. There are lots of viruses that have been using the names of legitimate files for avoiding their removal. restart.exe file is not an exception – it has already been linked to YourPrivacyGuard virus. When involved to malicious activity, this file is mostly used for performing harmful actions. While working in system's background, this file can be used for launching a virus, updating it, etc. For avoiding problems that are related to this file, you should terminate this process. 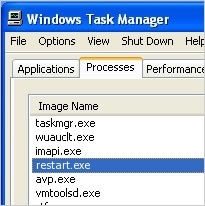 For checking the trustworthiness of restart.exe and eliminating it from the system, you should use RegCure Pro. This entry was posted on 2014-06-20 at 05:29 and is filed under Application files, Files. You can quickly scan the QR code with your mobile device and have restart.exe manual removal instructions right in your pocket.